*Life in Miniature*: Swap with Tweety Petie! I recently did a swap with Bridget of Tweety Petie Products. 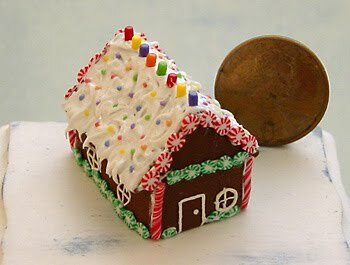 If you haven't visited her blog yet, you really should - Bridget is only 15 years old, but already an accomplished miniaturist. 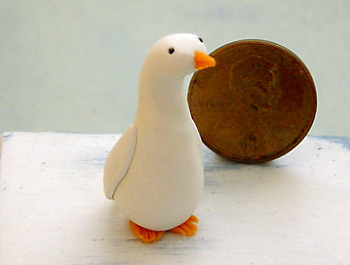 She works primarily in polymer clay and makes all sorts of scrumptious-looking food and other items. For our swap Bridget made me a beautiful gingerbread house, decorated with icing and tiny candies. The detail on it is amazing! 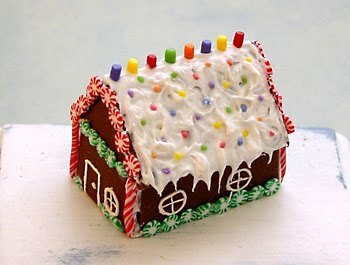 I love the candy sprinkles all over the roof and delicate icing icicles hanging over the edge. Thank you, Bridget, I love my new minis! Enhorabuena por esas preciosas miniaturas, vi tus libros en su blog. Habeis hecho un intercambio fantastico. 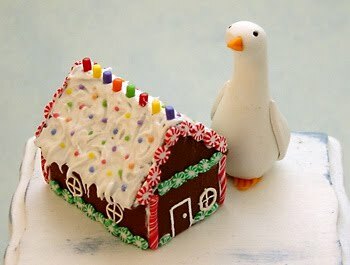 What a beautiful swap, the house and the duck are wonderfull and perfect!